Scripbox is Mutual fund investment tool.Scripbox helps investor for selection of right mutual funds.Scripbox is like ZIPSIP. 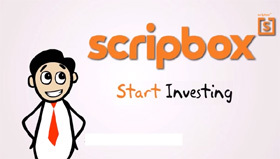 Scripbox is for new investor who is eager to invest money in mutual funds but don’t know where to start from. Let’s review what is Scripbox and how it can help you? Scripbox is online mutual fund investment platform. Scripbox allows you to generate mutual fund portfolio by inputting your details. You can make investment online using scripbox. It is claimed that mutual funds are suggested based on risk analysis, behavioral finance and practical considerations. Visit Scripbox website and create your free investing account. While opening this account you need to fill online form mentioning your details. You need to decide amount of investment. You need to mention it is recurring investment or one time. You need to also input that it is long-term investment or short-term. Within single click system will generate recommendation about mutual funds. It also take tax factor in account. What is Unique about Scripbox? Unique features of Scripbox is given below. Mutual fund selection without bias. Algorithm is made to select Top funds from 8000+ funds. It is claimed to be unbiased. Security offered by this solution during transaction is very good. It is available all the time. You can get answer of your queries by email or by phone. This solution is totally free and does not attract any hidden charges. It also offers fund for tax saving. Scripbox does annual portfolio balancing automatically. It offers easy withdrawal and fund tracking facility. It allows you to manage portfolio of entire family under one login. Scripbox provide convince for making online investment, however this portal may not replace need of financial planner. Minimum amount of investment using this tool is 1000 Rs/- per month, However to start SIP with 1000 Rs/- you need to invest 5000 Rs/- one time. Number of mutual funds suggested are mix of equity, debt and ELSS . No research paper is evident for selection of mutual funds. This tool is recommended for first time investor, however you can use this tool to quickly find mutual funds that are appropriate for you. It is recommended to take opinion of financial planner before making investment in mutual fund suggested by Scripbox. Do you use this tool for making investment in mutual fund? Thank you for your review of Scripbox. I would like to point out a few things in this review. The minimum investment amount per month is not INR 5,000. It’s INR 1,000. However, for you to do a SIP with minimum of INR 1,000, we require you to invest into the fund, a one-time amount of INR 5,000. This gives you the flexibility of investing money on any day of the month and also skip a month if you’d like. We provide 4 funds in equity, 2 in debt, and 2 for tax saving (Total of 8 funds). The rationale for a limited set of funds in equity is explained here >> https://scripbox.com/blog/only-4-funds/ The same can be applied for debt and tax saving (ELSS) offerings. Thanks for Correction.Review is updated according to details given by you.